A pearl is a hard, smooth, rounded (not necessarily round), lustrous object made of nacre (mother-of-pearl) that is organically produced by certain hard-shelled mollusks, principally oysters and mussels. Pearls are valued as gemstones and are used in jewelry. Pearls can also be crushed and used in cosmetics or paint formulations. Pearls are formed inside the shell of certain bivalve mollusks when nacre is secreted in successive thin, translucent, concentric layers around a foreign particle or irritant. Nacre is a natural substance used in forming the inner layer of a mollusk shell. It is made up of successive layer of inorganic calcium carbonate and organic conchiolin. Natural pearls are made up of 100 percent nacre (except for the foreign particle at the center). Cultured pearls are produced when a large, round bead is inserted inside the mollusk and it is then coated with nacre. The "queen of gems," pearls have had a long history of importance to human beings. Rare, treasured for their beauty, and one of the most expensive gems in the world, natural pearls have been tied to historical events and revered in religious texts. 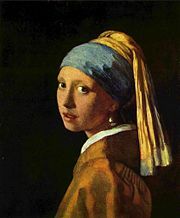 Their history has reflected the best of the human capacity for treasuring beauty and uniqueness, offering gifts to others, and creativity, with the invention of cultured pearls and diverse jewelry. However, they also have been a focus of human greed, as people have stolen, plundered, and fought over pearls. Pearls may come in various shapes and colors. They may be round, semi-round, button, drop, pear, oval, baroque, and ringed. While usually white, pearls also may have a creamy or pinkish tinge, or tinted with various colors such as yellow, green, and blue. Black pearls are highly valued because of their rarity. The shape of the pearl varies according to the irritant at the center of the pearl, and the color varies according to the inside of the shell of the mollusk that produces it. The largest pearl ever found came from the Philippines in 1934. It weighed 14 pounds (6.36 kilograms) when it was discovered by an anonymous Muslim Filipino diver off the island of Palawan. Later, a Palawan chieftain gave the pearl to Wilbur Dowell Cobb in 1936 as gift for having saved the life of his son. It was first called the “Pearl of Allah” and is now officially named the “Pearl of Lao Tzu” (Imperial-Deltah 2006). Pearls fit into two categories: freshwater and saltwater. As their name implies, freshwater pearls are formed in freshwater mussels that live in lakes, rivers, ponds, and other bodies of fresh water. Most freshwater cultured pearls sold today come from China. By contrast, saltwater pearls grow in oysters that live in the ocean, usually in protected lagoons. Akoya, South Sea, and Tahitian are the three main types of saltwater pearls. Overfishing and pollution have reduced pearl-producing oyster and mussel populations. Pearls are formed from nacre, a naturally occurring organic-inorganic composite. Also known as mother of pearl, nacre is secreted by the epithelial cells of the mantle tissue of certain species of mollusk. In these mollusks, nacre is continually deposited onto the inner surface of the animal's shell (the iridescent nacreous layer), both as a means to smooth the shell itself and as a defense against parasitic organisms and damaging detritus. When a mollusk is invaded by a parasite or is irritated by a foreign object that the animal cannot eject, a process known as encystation entombs the offending entity in successive, concentric layers of nacre. This process eventually forms what we call pearls and continues for as long as the mollusk lives. 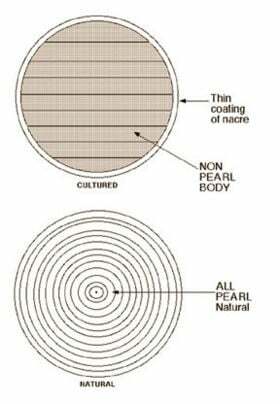 Nacre is composed of layers of calcium carbonate separated by layers of an organic, horn-like compound called conchiolin. Calcium carbonate (CaCO3) comes in two crystalline forms, the minerals aragonite or calcite. Hexagonal platelets of aragonite crystals are about 10-20 µm wide and 0.5 µm thick and are arranged in a continuous parallel lamina. The layers of platelets (aragonite or calcite) are separated by sheets of conchiolin, an organic matrix that is composed of elastic biopolymers (such as chitin, lustrin, and silk-like proteins). This mixture of brittle platelets and the thin layers of elastic biopolymers makes the material strong and resilient. Strength and resilience are also likely to be due to adhesion by the "brickwork" arrangement of the platelets, which inhibits transverse crack propagation. This design at multiple-length sizes increases its toughness enormously, making it almost equivalent to that of silicon. The iridescent appearance of the nacre is due to the fact that the thickness of the aragonite (or calcite) platelets are about 0.5 micrometers, which is comparable to the wavelength of visible light. This results in constructive and destructive interference of different wavelengths of light, resulting in different colors of light being reflected at different viewing angles. The iridescent inner layer of nacre found in mollusk shells is considered highly attractive by many cultures and is often used in making jewelry or as inlays in wood furniture and fret inlays for guitars. Chief sources of nacre are the pearl oyster, freshwater pearl mussels, and the abalone. Pearls are produced by mollusks, principally oysters, mussels, but also conches, clams, and abalones. 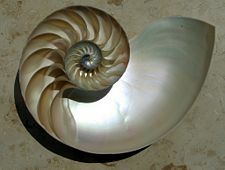 As a response to an irritant inside its shell, the pearl-forming mollusk will deposit concentric layers of nacre—that is, calcium carbonate held together by layers of the organic conchiolin. The commonly held belief that a grain of sand acts as the stimulant (the "nucleus") is in fact rarely the case. Typical stimuli include organic material, parasites, small crabs, food particles, or even damage that displaces mantle tissue to another part of the animal's body. These small particles or organisms enter the animal when the shell valves are open for feeding or respiration. 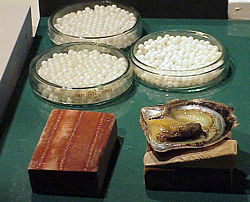 In cultured pearls, the irritant is typically a cut piece of the mantle epithelium, together with processed shell beads, the combination of which the animal accepts into its body (Landman et al. 2001). The unique luster of pearls depends upon the reflection and refraction of light from the translucent layers and is finer in proportion as the layers become thinner and more numerous. The iridescence that some pearls display is caused by the overlapping of successive layers, which breaks up light falling on the surface. Pearls are usually white, sometimes with a creamy or pinkish tinge, but may be tinted with yellow, green, blue, brown, purple, or black. Black pearls, frequently referred to as Black Tahitian Pearls, are highly valued because of their rarity; the culturing process for them dictates a smaller volume output and can never be mass produced. This is due to bad health and/or non-survival of the process, rejection of the nucleus (the small object that slips naturally inside an oyster's shell or inserted by a human), and their sensitivity to changing climatic and ocean conditions. Natural pearls are 100 percent nacre. The mollusk, being irritated by the intruder, secretes the pearl substance called nacre to cover the irritant. This process is repeated for many years, thus producing a pearl. Before the beginning of the twentieth century, pearl hunting was the most common way of harvesting pearls. Divers manually pulled oysters from ocean floors and river bottoms and checked them individually for pearls. Not all natural oysters produce pearls. In a haul of three tons, only three or four oysters will produce perfect pearls. For centuries, the main oyster beds lay in the Persian Gulf, in the Red Sea, and along the coasts of India and Ceylon (now Sri Lanka) (Ward 2000). After the discovery of the Americas, so many pearls (including many freshwater pearls from mussels) were exported to Europe that the New World gained the appellation "Land of Pearls" (Ward 2000). While previously natural pearls were found in many parts of the world, much of present day natural pearling is confined mostly to seas off Bahrain. Quality natural pearls are very rare jewels. The actual value of a natural pearl is the same as other "precious" gems, and depends on size, shape and quality. Today, almost all pearls used in jewelry are cultured pearls. Saltwater cultured pearls are produced by planting a core or nucleus into the oyster. Once the pre-formed beads are inserted, the oyster secretes layers of nacre around the outside surface of the implant before it is removed. The nucleus is generally a polished bead made from mussel shell. Along with a small piece of mantle tissue from another mollusk to serve as a catalyst for the pearl sac, it is surgically implanted into the gonad (reproductive organ) of the oyster. The pearls are usually harvested after one year for Akoya, and two to four years for Tahitian and South Sea. 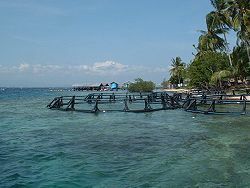 This mariculture process was first developed by Tatsuhei Mise Tokishi Nishikawa in Japan and later perfected by Kokichi Mikimoto, who was granted a patent for the process May 1, 1916. South Sea and Tahitian pearl oysters, also known as Pinctada margaritifera and Pinctada maxima, which survive the subsequent surgery to remove the finished pearl, are often implanted with a new, larger nucleus as part of the same procedure and then returned to the water for another two to three years of growth. The original Japanese cultured pearls, known as Akoya pearls, are produced by a species of small oysters, Pinctada fucata, no bigger than six to seven millimeters in size. Hence, Japanese pearls larger than ten millimeters in diameter are extremely rare and highly prized. In the past couple of decades, cultured pearls have been produced with larger oysters in the south Pacific and Indian Ocean. One of the largest pearl-bearing oysters is the Pinctada maxima, which is roughly the size of a dinner plate. South Sea pearls are characterized by their large size and silvery color. Sizes up to 14 millimeters in diameter are not uncommon. Australia is one of the most important sources of South Sea pearls. Tahitian pearls are also another South Sea pearl. In 1914, pearl farmers began culturing freshwater pearls using the pearl mussels native to Lake Biwa. This lake, the largest and most ancient in Japan, lies near the city of Kyoto. The extensive and successful use of the Biwa Pearl Mussel is reflected in the name Biwa pearls, a phrase which was at one time nearly synonymous with freshwater pearls in general. Since the time of peak production in 1971, when Biwa pearl farmers produced six tons of cultured pearls, pollution and overharvesting have caused the virtual extinction of this animal. Japanese pearl farmers now culture a hybrid pearl mussel—a cross between the last remaining Biwa Pearl Mussels and a closely related species from China—in other Japanese lakes such as lake Kasumi Ga Ura. In the 1990s, Japanese pearl producers also invested in producing cultured pearls with freshwater mussels in the region of Shanghai, China, and in Fiji. Freshwater pearls are characterized by the reflection of rainbow colors in the luster. Cultured pearls are also produced using abalone. Cultured pearls (nucleated and non-nucleated or tissue nucleated cultured pearls) and imitation pearls can be distinguished from natural pearls by X-ray examination. Nucleated cultured pearls are often "pre-formed" as they tend to follow the shape of the implanted shell bead nucleus. When a nucleated cultured pearl is X-rayed, it will reveal a different structure to that of a natural pearl. It exhibits a solid center with no concentric growth rings, compared to a solid center with growth rings. A natural pearl, however, is solid nacre or 100 percent pearl. Also, it is an all-natural shape, round being the rarest formation. When a jeweler x-rays the pearl, if the grit in the center of the pearl is a perfect sphere, the jeweler assumes that it is cultivated. This is because when the cultivators insert the grit, usually a polished piece of mussel shell), it is always perfectly round, so as to produce a more expensive, perfectly round pearl. If the center is not perfectly round, the jeweler assumes that it is genuine, and gives it a higher value. Imitation pearls are much easier to identify by jewelers. Some imitation pearls are simply made of mother-of-pearl, coral or conch, while others are made from glass and are coated with a solution containing fish scales called essence d'Orient. Although imitation pearls look the part, they do not have the same weight or smoothness as real pearls, and their luster will also dim greatly. A well-equipped gem testing laboratory is able to separate natural pearls from cultured pearls, non-nucleated cultured pearls, and imitation pearls. The value of the pearls in jewelry is determined by a combination of the luster, color, size, lack of surface flaw, and symmetry that are appropriate for the type of pearl under consideration. Among those attributes, luster is the most important differentiator of pearl quality according to jewelers. 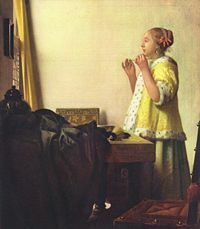 All factors being equal, however, the larger the pearl the more valuable it is. Large, perfectly round pearls are rare and highly valued. In general, cultivated pearls are less valuable than natural pearls, and imitation pearls are the least expensive. Pearls come in eight basic shapes: round, semi-round, button, drop, pear, oval, baroque, and ringed. Perfectly round pearls are the most expensive and are generally used in necklaces, or strings of pearls. Semi-rounds are also used in necklaces or in pieces where the shape of the pearl can be disguised to look like it is a perfectly round pearl. Button pearls are like a slightly flattened round pearl and can also make a necklace, but are more often used in single pendants or earrings where the back half of the pearl is covered, making it look like a larger, round pearl. Drop and pear shaped pearls are sometimes referred to as teardrop pearls and are most often seen in earrings, pendants, or as a center pearl in a necklace. Baroque pearls have a different appeal to them than more standard shapes because they are often highly irregular and make unique and interesting shapes. They are also commonly seen in necklaces. Ringed pearls are characterized by concentric ridges, or rings, around the body of the pearl. There is also a unique way of naming pearl necklaces. While most other necklaces are simply referred to by their physical measurement, strings of pearls have their own set of names that characterize the pearls based on where they hang when worn around the neck. A collar will sit directly against the throat and not hang down the neck at all; they are often made up of multiple strands of pearls. Pearl chokers nestle just at the base of the neck. The size called a princess comes down to or just below the collarbone. A matinee of pearls falls just above the breasts. An opera will be long enough to reach the breastbone or sternum of the wearer, and longer still, a pearl rope is any length that falls down farther than an opera. Necklaces can also be classified as uniform, where all the pearls are the same size; graduated, where the pearls are arranged in size from large in the center to smaller at the ends; or tin cup, where pearls are generally the same size, but separated by lengths of chain. Pearls have a long history of importance in culture and religion. Natural pearl necklaces throughout recorded history were a treasure of "almost incomparable value, in fact the most expensive jewelry in the world" (Ward 2000). Rare and expensive, they were reserved mostly for the noble and the very rich. Historian Suetonious wrote that the Roman general Vitellius financed an entire military campaign at the height of the Roman Empire by selling only one of the pearl earrings of his mother (Ward 2000). Sacred books of many religions reference pearls. According to Bahya ben Asher (Rebbenu Bachya), a thirteenth-century rabbi and scholar of Judaism, the word Yahalom in Exodus 28:18 means "Pearl" and was the stone on the Ephod (a ritual garment) representing the tribe of Zebulun (one of Jacob's 12 sons). In a Christian New Testament parable, Jesus compared the Kingdom of Heaven to a pearl of great price. Additionally, the twelve gates of heaven are known as the “Pearly Gates” (Rev. 21:21), and considered each to be made of a single pearl. The Vedic tradition describes the sacred Nine Pearls which were first documented in the Garuda Purana, one of the books of the Hindu holy text Atharvaveda. Famous Pearls, Imperial-Deltah. Retrieved August 30, 2007. Lumpkin, S. 2002. Review of N. H. Landman, et al. Pearls: A Natural History." Zoogoer (January-February 2002). Published by Friends of the National Zoo. Retrieved August 30, 2007. Ward, F. 2000. The History of Pearls. PBS: Nova. Retrieved August 30, 2007. This page was last modified on 7 October 2016, at 19:04.